The chairs we sent off to be recovered are now home. 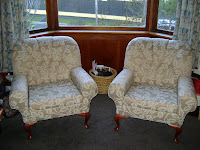 I am very pleased with them and they look so good in my day room/sewing room. When I have more time I will post some pics of "The Sewing Room"
Hope you all have a suny week where ever you may be. The chairs look fabulous, you will be so pleased to have them back. I look forward to sitting on one of them next time I visit! !